roll and packed with hard tube. 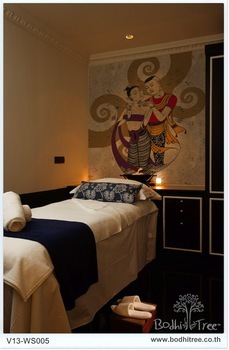 Thailand spa decoration wallpaper. It's quick&easy solution for your shop renovation or new decoration. MOQ is 5 SQM. Thai Art wallpaper collection is suit to Thai restaurant, Thai Spa and oriental style decoration. Wallpaper is easy solution to change your shop character. Thai Art wallpaper helps you save time on renovation, it is just overnight to get new look of Thainess. 2. Bodhi Tree to estimate wallpaper cost for your approval. Price is varied by design. Minimum order is 5 square meters. 3. For international order, Bodhi Tree will send you paypal link for the payment at full amount. 4. After payment is received, we will adjust the selected design to be proportion with your wall size and send to you via email. For out-of-bangkok, customer to email us the wall’s photo. We will insert the selected design to your photo. You will see how it will look like after installation. If the wall construction is not ready, we can show design adjustment with its proportion for your approval. 5. After design is approved, we will proceed for production and then delivery. It will take 10-14 days after design is approved. Full payment will be made before delivery. Our wallpaper is shipped to several Thai restaurant and Thai Spa around the world. Shipping cost will be estimated since the cost will be varied by weight or amount of your wallpaper require and also by destination to be shipped. If you plan to visit Bangkok for vacation or business trip, you can drop us your order and leave some 1-2 week for us to produce it for you to pick up and carry back by your own. We roll and packed it properly for loading to the airplane, you have to no worry about carrying it.